How do you choose your favourite photo of the year? It's not easy, especially if you're not that confident or experienced a photographer. Writing, not photography, first drew me to blogging. Photography was something I had little experience or knowledge of. To be honest, it terrified me. Far too technical and numerical for my liking. Yet, I believed photos enhance the written word so I gave it a go. Little by little my confidence emerged and my skills grew. 6 months into blogging I got my first DSLR as a birthday present and my interest in photography began. These days I love being behind the camera and using my photos to portray my vignettes of this beautiful world. Many minimalist bloggers forgo photos in their posts to give their writing more gravitas. I prefer to use photos in most of my posts to show simplicity, beauty and happiness in action. Something I won't be paring down is my love of photography. It's a vehicle for my creativity and I kind of 'get by' with limited technical knowledge. I hope the photos I share here on my blog capture the energy, intimacy and colour that make up my life. The above photo is one taken at Packwood House, Warwickshire in August. It's a place I've visited several times this year in different seasons. This photo was taken on a beautiful sunny day and I was with my mum and dad. 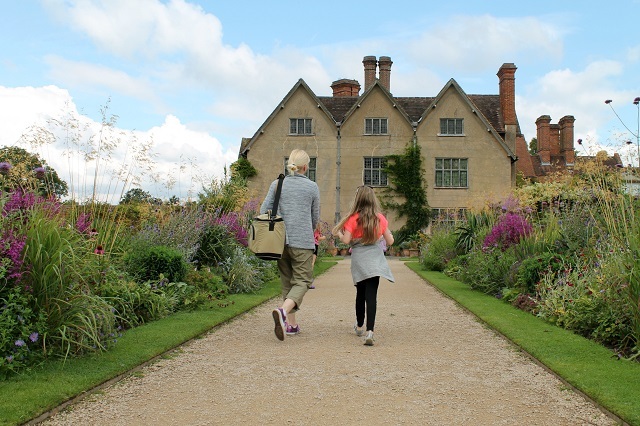 As I crouched down by the side of my dad's wheelchair we took in the beauty of the house, the planting and the sheer delight of people, like this mum and daughter, on a day out. Their happiness mirrored ours and that's why it's my favourite photo. Joining in with Susannah Conway's December Reflections project. A chance to ponder.